Real-Time Intelligence involves principles for building applications that enable enterprises to take advantage of the information flowing through their IT systems immediately, as it arrives. Read more about real-time intelligence here. Complex Event Processing enables the information contained in the events flowing through all of the layers of the enterprise IT infrastructure to be discovered, understood in terms of their impact on high level management goals and business processes, and acted upon in real time. This includes the events created by technologies such as RFID. 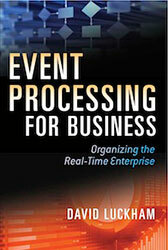 CEP employs techniques such as detection of complex patterns of many events, event streams processing, event correlation and abstraction, event hierarchies, and relationships between events such as causality, membership, and timing. CEP is an enabling technology for service oriented architecture (SOA), event driven architecture (EDA), business process management (BPM) and Real-Time Intelligence.